As digital artists we all know that there are many..MANY different programs that we can use. What's good or bad about each one of them? I'll tell you my personal experience on the goods and bads of the programs I've used. To help me explain the goods and bads about Sketchbook I have done a little interview with an alumni of UAT, Devon O'Mara. Devon graduated with a Game Art and Animation degree and owns the Autodesk Sketchbook Pro. Having bought the pro version, Devon mentioned that it allows you to get an account with sketchbook. This account can be used when using any version of sketchbook. When you log into Sketchbook with a pro account the application automatically updates to being the pro version. This is great for artists who have it on multiple devices and don't want to pay for multiple versions of the pro versions. Sketchbook is also mobile! you can download this software on your Kindle, Nook, or other mobile devices! Having used Sketchbook myself I agreed with Devon that the blending in this program is great. It allows you to blend easily and well without the threat of freezing the program like Photoshop does. Sketchbook is a great program to use traditional pen, pencil, or marker styles. This program is great for an artist to draw out a quick idea or sketch and still have the ability to turn it into a finished piece. I personally love the realistic feeling of the pencil tool. I have always had a difficult time with translating my traditional art skills into digital art skills. With Sketchbook I feel like I am actually using a pencil on a canvas. Another great tool set that Sketchbook has is the reference tools. Sketchbook allows the user to use reference lines and other shapes. A lot of other programs don't allow you to do this or do it in a more complicated way. Sketchbook allows you to adjust the angle, size, and pen size to each tool. If you don't have the pro version you are missing out on a lot. I think that this is one of the major downsides to this program. 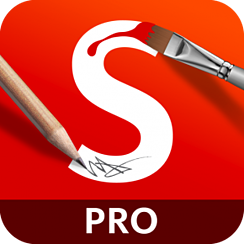 If you have the free version you are limited to the amount of layers, pens, and many other tools that sketchbook offers. Now Sketchbook is not Photoshop or Corel so it is limited to the amount of layer effects and overall things you can do. This is a program that is solely for digital painting and sketching, not image manipulation or serious painting. If you use this on a kindle, nook, or mobile device you may run into some lagging or other issues. There's not much that's bad about Sketchbook if you are aware of it's capabilities. I truly recommend this program to any artist who loves digital painting. As I said make sure you know what the program can and cannot be used for before diving straight into it. This program has great tools and gives a great realistic feeling to doing digital art. I personally use Sketchbook for the sketch and rough draft of any piece of art that I do. This program is usually the first one I go to and my first step in the process of completing a piece of art. As Devon and I say " If Corel and Photoshop had a simple baby, Sketchbook would be it." Thanks again to Devon O'Mara for sharing her experience with Sketchbook!